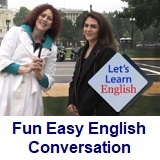 ﻿ Fun Easy English - new american english standard conversation Voice of America VOA learning English for beginners introduction. 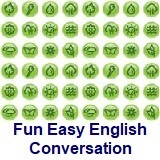 This is a collection of VOA conversation lessons for beginners. Each lesson has a conversation video, a video script, audio listening practice, video speaking practice, video pronunciation practice, and a new word section. 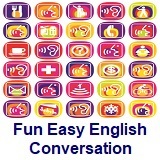 These are all of the Let's Learn English Lessons for beginners. 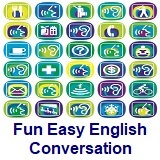 There is a total of 52 lessons covering important English conversation, pronunciation, grammar, and reduction topics. Lesson 9 - Is It Cold? Lesson 14 - How About This? Lesson 15 - I Love People-Watching! Lesson 16 - Where Are You From? Lesson 21 - Can You Come to the Party? Lesson 25 - Watch Out! Lesson 28 - I Passed It! Lesson 34 - What Will I Do? Lesson 35 - Let’s Make Dinner! Lesson 48 - Have You Ever ...? Each of the lessons above has an activity in PDF format. These are on printable pages. The following is a convenient list of all the activities. Each activity opens to a new window.